Carnegie Postdoctoral Fellow Caitlin Murphy represented the Geophysical Laboratory at the third annual USA Science and Engineering Festival. 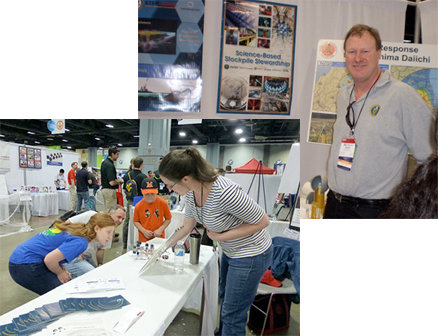 The Festival, held April 26-27, 2014 in Washington DC, is the largest science, technlogy, engineering, and math education event of its kind in the US. More than 750 leading scientific organizations presented hands-on science and engineering activities for people of all ages. Caitlin's topic was "How does high pressure affect materials that have defects and impurities?" Caitlin has been supported by CDAC at Carnegie. In addition, Robert Hanrahan, former Program Manager for CDAC at NNSA, discussed stockpile stewardship and non-proliferation as a part of the State Department's booth on in the National Security section of the Festival.